TEDx programs are designed to give communities, organizations, and individuals the opportunity to stimulate dialogue through TED-like experiences at the local level. On September 7, the program TEDxABQ 2013: Be Extraordinary took place at Popejoy Hall on the campus of the University of New Mexico. To help ensure superior audio quality with freedom from cables, Digital Hybrid Wireless microphone technology from Rio Rancho, NM-based Lectrosonics was placed into service. 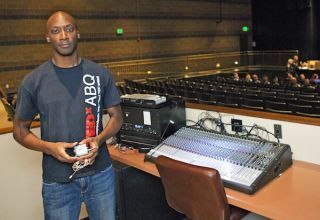 Albuquerque, NM-based Nicholas Taylor, technical director of the event production firm On Cue Stage and Event Services, serves as the production manager for TEDxABQ, TEDxPhoenix, and TEDxCharleston conferences. As the person responsible for coordinating all aspects of stage design, audio/visual equipment, and event logistics, the issue of sound reinforcement falls under Taylor’s domain. In an effort to ensure a high level of speech intelligibility and first-class audio for TEDxABQ 2013: Be Extraordinary, Taylor deployed a wireless microphone setup that consisted of four Lectrosonics SMQV Super-Miniature beltpack transmitters, four Lectrosonics HM172 earset microphones, and a Venue receiver system fully stocked with three VRS and three VRT receiver modules.